You read only interesting findings because only those get published, get written about and popularized in social media. Experiments that find no statistically significant difference don’t leave the filing cabinets of researchers because no one wants to read a story where nothing happens. This is such an experiment, where there was not enough evidence to reject the null hypothesis. Let us start at the beginning. This experiment is about people’s perception of a person’s competence based on whether the person speaks in absolutes with no room for alternatives or whether the person speaks in terms of likelihood, accounting for alternative explanations. 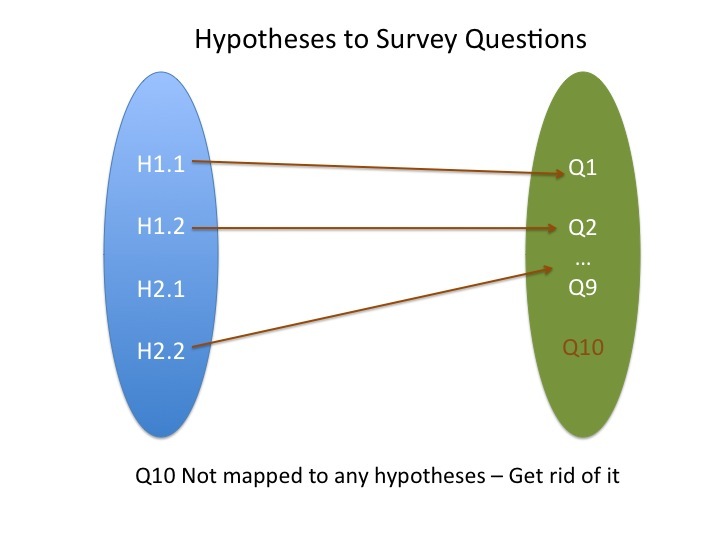 Hypotheses: You do start with hypotheses before any data analysis don’t you? Here are the hypotheses I had about speaking in absolutes/likelihoods and perception of competence. H1: Business leaders are judged to be more competent when they speak in absolutes. Conversely, using terms like “likely” may be perceived as wishy-washy and hence signal incompetence. Of course the null hypothesis is there is no statistically significant difference in perception of competence based on whether the subject in question speaks in absolutes or in likelihoods. 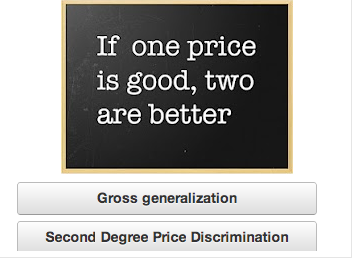 Experiment Design: So I designed a simple 2X2 experiment, using SurveyGizmo. You can see the four groups, Company Executive and Scientist as one dimension, Absolutes and Likelihoods on the other. I designed a set of 4 statements with these combinations. 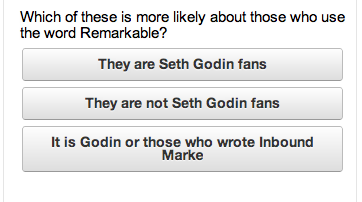 When people clicked on the survey they were randomly shown one of the four options. This was a very generic statement meant to speak about results and what could have caused it. I avoided specific statements because people’s domain knowledge and preconceived notions come into play. For example, if I had used a statement about lean startup or social media it would have resulted in significant bias in people’s answers. Based on just one statement, without context, people were asked to rate the competence of the person. Some saw this about Scientists, some about a Company Executive. Note that an alternate design is to show both Absolute and Likelihood statement and ask the respondents to pick the one they believe to be more competent. I believe that would lead to experimental bias as people may start to interpret the difference between two statements. Results: I collected 130 responses, almost evenly split between four groups and did t-test on the mean rating between the groups (Scientists: Absolute/Likelihood, Executive: Absolute/Likelihood, Absolute: Executive/Scientist, Likelihood: Executive/Scientist). And you likely guessed the results from my opening statements. There is not enough evidence to reject the null hypothesis in all the different tests. That means and difference we see in competence perception of those speaking in absolutes and likelihoods is just random. Speaking in absolutes, a desired trait that leaders cultivate to be seen as competent and decisive leader, has no positive effect. Including uncertainties does not hurt either. So go right ahead and present simplistic one size fits all solutions without self-doubt. After all stopping to think about alternatives and uncertainties only takes time and hurts ones brain with no positive effect on the audience. Caveats: While competence is not an issue I believe trust perception could be different. That requires another experiment. Since I wrote that article, their Product Manager emailed to say they removed their statement on, “pull out hypothesis”. This is a limited tool with ability to ask just one question and no way to ensure that the same user will answer multiple questions for doing customer level analysis. There is one more item which is their minimum sample size. You cannot order anything less than 1000 samples. 1. Aided Recall: Present them a choice of different brands ask them how many of these they recognize. When you are trying to get very quick and high level data on customer awareness or preference of your brand, this is a great tool. The results are especially actionable when you get extreme results like no one knows about you. If you are trying to find which brand they recognize the most then you can do that as well with different question type. However, due to its question format limitation, Google Customer Surveys cannot help with Unaided recall. 2. Finding Consideration Set: Present them a choice of different brands and ask them how many will they consider buying for solving a particular need. This is similar to Aided Recall but the question is more focused. You are not simply asking about awareness but whether your brand makes it into their consideration set. 3. Brand Association: Present them an image or a statement and ask them to pick a tag-line or brand they believe goes with it. 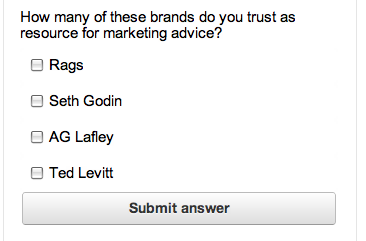 Another variation of this question is asking them to associate your brand with an unrelated field. 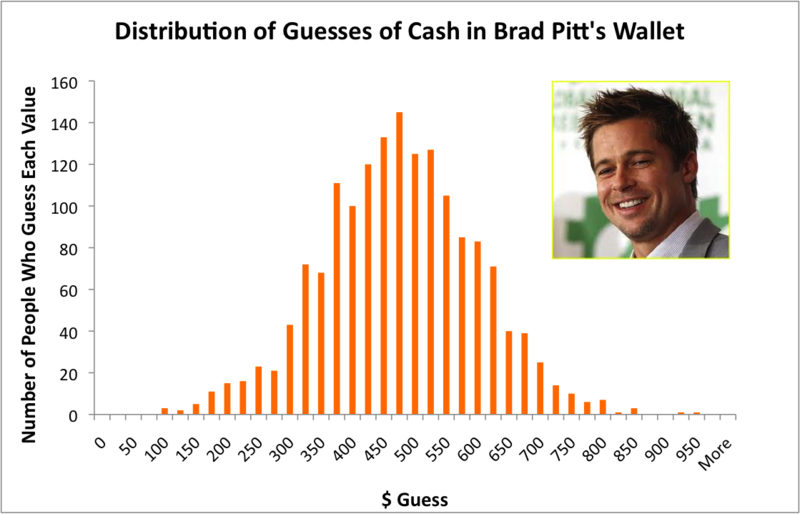 A typical example is, “if our brand were a movie actor, who will it be”. Ability to use images is a very powerful feature. It creates many different opportunities. For example for testing your advertising copy or the images you use in your collateral. It is better to poll your audience whether the image you used looks more like a bean bag or boxing glove before you launch your expensive advertising campaign. There is however a big limitation because of the length of questions you can ask (as you see in the third option in the image on the left). There you have it. A tool with limitations but is effective for specific areas. It opens up new ways to collect data and test when none existed before. A corollary for this post would be cases where you should not use this tool. That includes finding price customers are willing to pay or asking them about how important a single feature is. You have to wait for another post for the reasons.